Kaufteh are meatballs. Most cultures have meatballs and no doubt everyone will say that theirs are the best! To me meatballs are lovely, small enough to shape in the palm of your hand and just a perfect end to a long day. 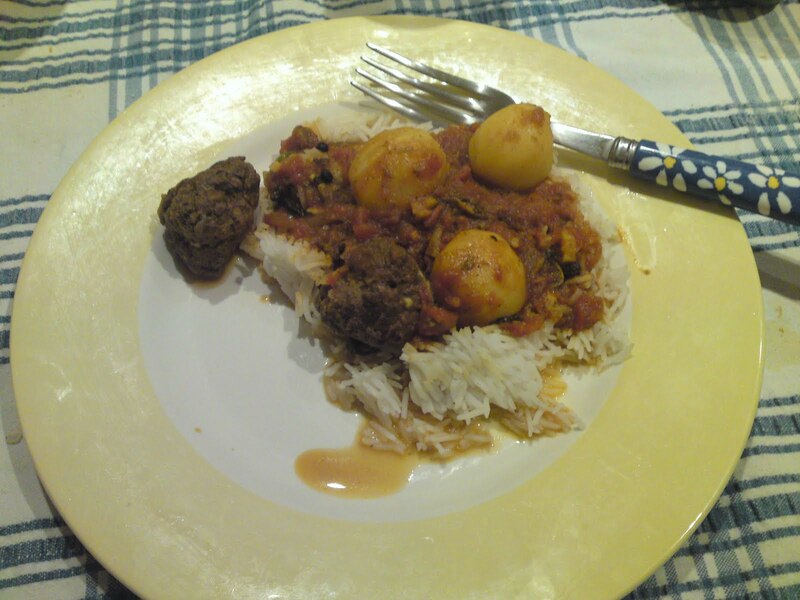 Ask anyone who knows me, and they will tell you that my favourite food is kaufteh (meatballs from Pakistan). I just adore them. I love the whole process from the making of the meatballs, to peeling the potatoes (and that has to be the only time I love peeling potatoes). Making them gives me so much pleasure that it is abnormal. I prefer to make the kaufteh in a big batch, then I fry the meatballs, and then freeze them, meaning I can have meatballs without so much work later on. As always I suggest making your own meatballs and playing around with them until you find a flavour combination which works for you. Kaufteh normally contain finely sliced onion, ginger, garlic, chillies and spices along with herbs mint and coriander. Egg is the only binding agent, there is no need to add flour whatsoever. Kaufteh should be the size of a golf ball. Fry off the meatballs and set aside or freeze and then make the sauce. 3. On a medium heat cook the spices off, so that when you move a spoon through the tomatoes the oil is visible as a clear line. 4. Then add the kaufteh, heat them in the paste add enough water to cover the kaufteh and allow to boil. 6. When a knife goes through the potatoes add the peeled eggs. 7. Allow the eggs to heat through in the sauce for a while so that also absorb the spices add the chopped green chilli. 8. Finally top with coriander and serve with freshly cooked rice. Yesterday, somehow turned into a rather busy day. Before I knew it, it was late to cook from scratch. The meat in the freezer was rock hard and neither of us were in the mood of something light and quick. 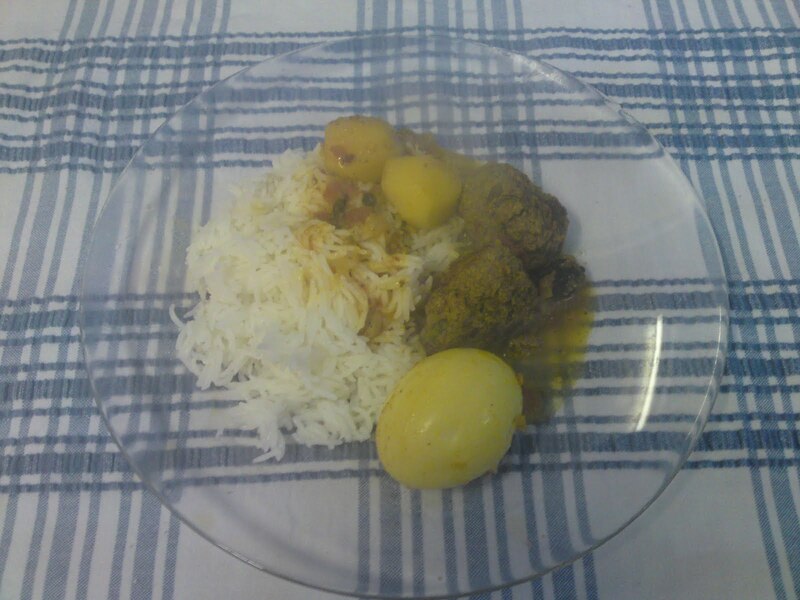 Midway through my ponderings I thought of the kaufteh (meatballs) that I had cooked and frozen before Ramadan. Better yet, I thought back to the masala (the sauce) that I had also made up and frozen separately useable for pretty much anything. The joy in coming home and being quickly able heat up the masala, put in the frozen kaufteh and then in next to no time the warm aroma of meaty spices was wafting from my kitchen.